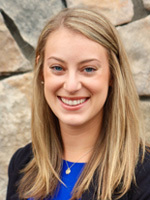 Chelsea McKinnis is a fully licensed Speech-Language Pathologist with her Certificate of Clinical Competency. She received her Master’s of Science in Speech-Language Pathology from Idaho State University in Meridian in 2017 and has been living in the Treasure Valley ever since. She received her undergraduate degree in Speech and Hearing Sciences from the University of Illinois at Champaign-Urbana in 2014. Chelsea enjoys treating clients of all ages and various medical diagnoses, with a specific interest in early intervention. She provides treatment and assessment in the areas of receptive and expressive language, articulation and phonology, pragmatics, fluency and voice disorders. Since moving to Boise from San Diego, she spends her free time exploring the Treasure Valley’s outdoor activities as well as exercising and baking.